CNN recently posted a video about a human "exoskeleton" designed by a major US defense contractor. The contraption, which looks like something out of Iron Man, exponentially increases a soldier's strength. One problem is that it requires a large energy supply. It's also vulnerable to dust. I am a soldier. Please, for the love of God, stop giving us more junk to carry. We have too much stuff as it is. If I posted my hand receipt on this sound off, you would be shocked. For example, I have 12 sets of eye protection! I only have two eyes! Each time we get new stuff, the military rarely has us turn in the old stuff. It just keeps stacking up. I have 6 duffel bags full of issued gear. It weighs more than I do, and takes up more room than I do. Do you realize how much money is being spent to transport all this? Also, the gear is often designed with an original intent, which rarely gets honored by leadership. They favor good looks and uniformity over functionality. Some of the gear we have now was meant to flexible for the individual. However, policies always get put out which negate it. So what is the point? 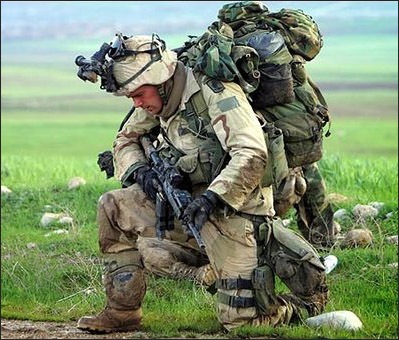 We wear so much armor and gear in combat it is difficult to move. It slows us down. If forces us the take more breaks. It creates heat risks. That is dangerous! The taxpayers are going to get a surprise in about a decade when all the back injuries start popping up in VA hospitals. Get ready to pay!!!! Finally, beware of the true motivation behind these new creations. Greedy companies try to act like they care about supporting troops, but in the end, they do it for profit, not patriotism. They will waive any flag that allows them to make money. If we don’t make them money, they’ll just go overseas and make it. They do already. How might the government be inclined to react to this soldier's observation and insight? See here. Hm... funny. This reminds me reading a bit earlier that certain Japanese companies are working on commercial exoskeletons for the country's ageing population of farmers. The US story seems just as ironical. While Japan and the US put so much effort into making it possible for a few people to do more, in countries like India they just hire more workers. It seems to me Japan might want to entice poor Indians or Filipino to work their paddy fields. In a world where so many have so little opportunity, it strikes me as not particularly ethical for rich world governments to be investing a lot in robotics. What I mean is that it's one thing for a company set up a robot factory if it is economical to do so, but it's another thing if the deployment and development of robots (that replace real jobs) is economical only because a government has subsidize their development and deployment. From a global perspective, using a human to do a job solves 2 problems. A robot solves only 1 problem, and will almost certainly contribute to global unemployment.